Plans for the new Casement Park stadium in west Belfast are facing possible further delays due to the absence of Stormont ministers. The Department for Communities (DfC) said a sharp rise in the cost - to £110m - means it cannot give the go-ahead, even with planning permission. It is the latest setback in a multi-million pound project which has been beset with problems. Initially, the cost of building the stadium was estimated at £77m. This figure was made up of £15m from the Gaelic Athletic Association (GAA) and £62m from the Stormont executive. In an interview with the BBC on Friday, DfC Permanent Secretary Tracy Meharg said: "It is not my position to take decisions which would rightfully be one for the minister or an executive." Casement Park Q&A: What's the state of play? It is rare for senior civil servants in Northern Ireland to give media interviews. However, Ms Meharg said that she wanted to be "transparent", given the public interest in the planned 34,500 capacity stadium. The main stumbling blocks facing the project are a lack of planning permission and a significantly increased cost, amid the backdrop of a Stormont executive that is no longer functioning. 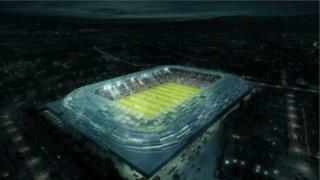 Ms Meharg said: "At the moment, what we have is a commitment from the executive to fund £62m for Casement Park. "In the time that has passed since then, clearly the costs have risen. "We will be assessing the business plan in the context of the new costs and we will be determining whether indeed we can make a recommendation that it represents value for money. "But of course, given the fact that this is a [departmental] cross-cutting issue, given the fact that it was a commitment from the executive, this department alone will not be able to make that decision. That would be a matter for a minister." Ms Meharg recently took over as permanent secretary at the department, having previously held a senior position at Invest NI. In spite of the absence of ministers, a range of public services are still being delivered, but Ms Meharg admitted civil servants had been placed in a difficult situation. "Nobody would want to be in this position - it is not comfortable. It is normal for civil servants to work under the direction and control of ministers," she said. The initial proposals for the redevelopment of the west Belfast stadium collapsed in 2014 under a legal challenge brought by a group of local residents. A fresh planning application was submitted in February 2017 and is now awaiting a decision from the Department for Infrastructure. If planning permission is granted, it could be subject to a legal challenge.